Sinusoidal AC inverters of the SW series can be used in many situations in mobile and stationary settings. All models are authorized for permanent installation in vehicles thanks to the E-certification. 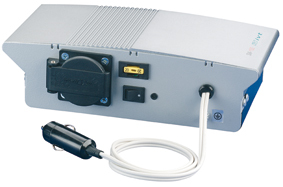 The 100 W and 150 W models can be used flexibly in different vehicles. If required, simply insert the vehicle adapter plug into the 12 V socket (24 V socket) of the vehicles or boat so that permanent installation is not always necessary.